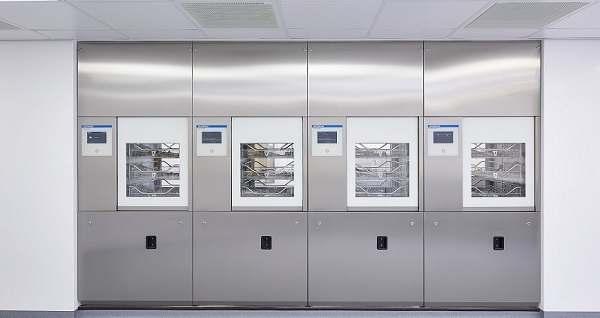 The first UK installation of a new pass-through disinfector to reprocess up to three endoscopes simultaneously took place at Blackpool Victoria Hospital this month. The reprocessor is designed to ensure the safety of patients and employees and protect sensitive endoscope instruments. Endoscopes are important therapeutic diagnostic devices used to investigate the cause of unusual symptoms, help perform certain types of surgery, or take biopsies. Flexible endoscopes are complex reusable instruments that require unique consideration with respect to decontamination as they are routinely exposed to mucus, gastrointestinal secretions, respiratory secretions, blood, saliva, faeces and bile. The greatest potential risk is transmission of infection from one patient to another using the same contaminated endoscope; any patient must be considered a potential infection risk, and each endoscope and device must be decontaminated with the same rigour following every endoscopic procedure. There is also the potential for transmission of infection from patients to healthcare workers. Endoscope reprocessing involves the cleaning, disinfection and sterilisation of the endoscope. This includes the external surface of endoscopes, their internal channels for air, water, aspiration and accessories which have been exposed to body fluids and other contaminants. In contrast to rigid endoscopes and most reusable accessories, flexible endoscopes are heat labile and cannot be autoclaved. Endoscope reprocessing solutions are used by skilled and trained staff for decontamination and cleaning of an endoscope. The ETD Double from Olympus is based on a 360 degree endoscope decontamination concept and provides continuous leak and flow control checks, cleaning, disinfection with a compatible chemical solution, three rinses, and verification of critical parameters such as temperature, pressure and chemical concentration.